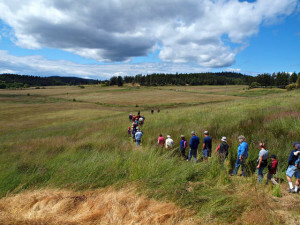 Since 2010, the San Juan Island “Know Your Island” Walk series has helped residents of the island to explore their history, parks, trails and public infrastructure. Each walk lasts approximately 2-3 hours and features a guest leader from the community who talks about the history, character and environment of the featured location. The walks are free to attend and open to all ages and abilities. The walks provide not only opportunities to exercise and to experience the beauty of San Juan, but also to create long-lasting and vital connections between members of the San Juan Island community. A full overview of the Know Your Island Walks program is available here (pdf).